There is nothing in the world like homemade bread. It’s fun to make, frugal, healthy and tastes amazing. Winter is the perfect time for bread baking as it warms your kitchen and your soul. Homemade bread goes down especially well with honey and butter or homemade jam. If you haven’t tried making your own loaf before don’t worry just relax, follow the directions and trust in the process. Once you start you may never stop. 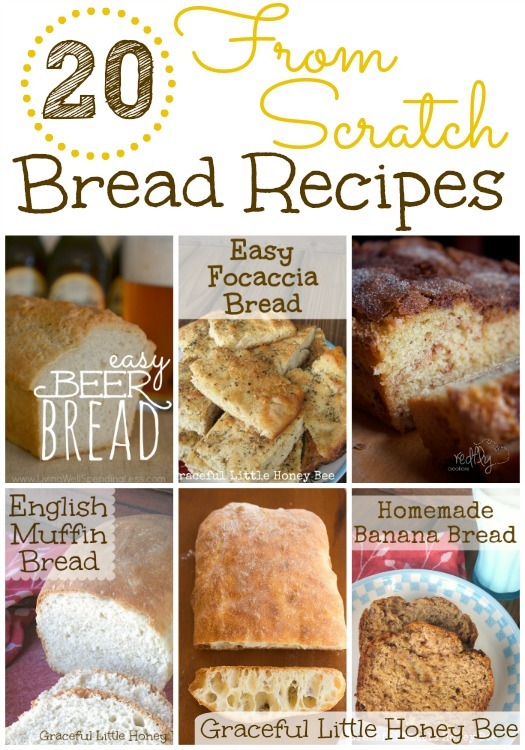 🙂 Here are 20 from scratch bread recipes to help you along on your bread making journey. I make banana bread at my house and I have made beer bread before too. I agree, making homemade bread in the winter is the best! Thanks for the great ideas! I'd like to see your banana bread recipe. the link above routes to a cinnamon one. I fixed the link. Thank for letting me know.